I wrote an article for The Bold Italic, a kickass online publication about how amazing my hometown, San Francisco, is! Smell is by far the most challenging sense to put into words. A song can be sung in one’s head, and a vista can be revisited in a dream, but smells are elusive when not physically present. More often than not, scents can’t be defined in exact words; only the memories that they inspire can truly give them meaning. It’s a universal experience to catch a whiff of an aroma and suddenly have a vivid memory of a time or place we’ve been in. This is why an olfactory tour of San Francisco can be an adventure for tourists and locals alike. It highlights a unique perspective of the city that, once experienced, can never be forgotten. 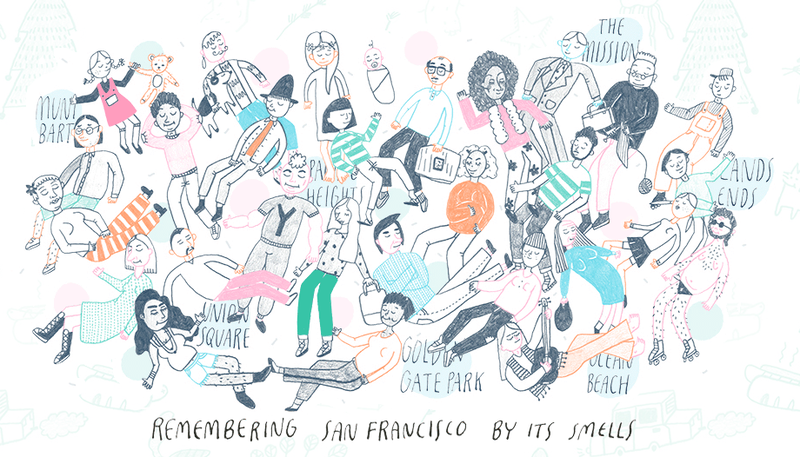 The smells provide a shared nostalgia that are, without question, explicitly San Franciscan. Follow your nose with this collection of seven places in SF that can be experienced through their unique odors. Some memories are just sweeter when all it takes to relive them is a special smell to bring you back. When the sun goes down, and as you approach the ocean, your nose will fill with the expected scents of the sea, combined with the sharp scent of burning wood from starlit beach bonfires. This is one of the best olfactory surprises San Francisco offers. These smells intermingle with the sea-borne fog, a wispy gray beast floating bay-ward. Eventually, the smell of the smoke dissipates, but the fog always persists. There is no doubt about Union Square’s role as a tourist destination. Yet when December rolls around, the Square is transformed from merely a place to find name-brand stores into a winter wonderland where you can almost smell Christmas in the air. This wintry smell is only accessible when the adoptable kittens and puppies fill up the Macy’s window displays and the giant Christmas tree consumes the skyline. You will recognize the unique odor combination of Freon cooling the ice rink, perfume wafting out of the department stores, and the moist scent of your own breath filtering through your scarf. Add in the rich fragrance of hot chocolate from the top of the Grand Hyatt, and you’re golden. When the bars let out at 2 a.m. on Valencia or Mission streets, you will undoubtedly be greeted by the smell of a million bacon-wrapped hot dogs grilling streetside, peppered with the intoxicating aroma of onions and relish. But this scent is not complete without the smell of stale, spilled liquor that characterizes favorite watering holes like Beauty Bar and Casanova Lounge, and all the regrets that come with the nights spent at them. The smell of overworked car engines is the visceral evidence of our struggles with San Francisco’s topography. As a child, my dad would strap my sister and me into the passenger side of his two-seater, and we would drive through Pacific Heights looking for signs reading “HILL.” Hands in the air, we would fly down the steepest of the steep hills toward Lombard Street like we were on roller coasters with the greatest view on Earth before us. The choking smell of car fumes is forever implanted in my mind as a part of the makeshift amusement park that is San Francisco’s hills. While walking up or down a nonfunctioning escalator in Muni or BART stations, pungent aromas will likely waft up from under your feet. You’ll notice hints of track grease with strong suggestions of human urine. All of this will be tied together by a stuffiness that you can taste on your tongue. What you smell is what happens when San Francisco’s homeless use escalators as toilets. Forget everything you know about what the ocean smells like, because the San Francisco shoreline does not adhere to assumptions. Here you will find genuine ruins nestled in the city landscape, crumbling stone monuments that serve to remind you of the ever-changing culture of this city. Down the road at the edges of the old Sutro Baths, where you can spy the fading paint of long-lost pools, you’ll smell stagnant, algae-ridden water refreshed by the cool breeze of the ocean and the musk of wet sand. Pair this with the wealth of pure SF history that surrounds you, and this scent will forever remain unequivocally San Franciscan in your mind. If you have ever attended Outside Lands, Hardly Strictly Bluegrass, or any other music-based event in Golden Gate Park, then you’ll recognize the pungent mix of straw, San Francisco cigarettes (marijuana), and eucalyptus that permeates the events at any given time. The city is alive with smells well beyond what’s listed here, and all you have to do is open your heart and your nostrils to find them. I encourage you to explore meaningful places and take note of the olfactory elements so that you can experience your favorite parts of San Francisco wherever you are and whenever you want with just a quick sniff.